Mobile County Republican Party | Fighting to make sure our conservative principles are heard. Join our SMS alert! Text 'EZMobileGOP' to 797979 to sign up. The Republican Party is a party of can do. We are a party of prosperity. The Mobile County Republican Party is open to anyone and everyone interested. Our membership consists of both precinct, and at-large representatives. The number of places for a particular voting precinct is determined by the number of Republican votes cast in each particular precinct. Meetings are on the first Monday of the first month of each quarter (January, April, July, October) and begin at 7 pm at Westminster Presbyterian Church, at the corner of Airport and Sage. 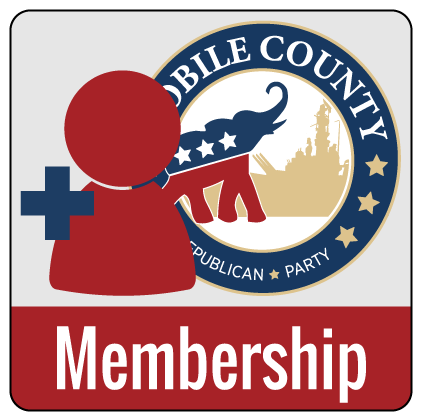 Meetings are open to everyone interested in becoming involved with the Mobile County Republican Party. Looking to contact us with any questions or concerns? Click here.